While growing fruit is relatively trouble-free, there are some common problems you may face when planting and growing the fruit. Every problem has a solution, however, so you needn’t abandon your efforts completely. More fruit bushes and trees are lost due to poor drainage than any other reason. This is where the roots of the tree are saturated with water because the soil is waterlogged. Poor drainage is often an inherent problem in our soil, and usually happens if you have a heavy, clay soil. Certain factors can increase the incidence of poor drainage, however. If the piece of land hasn’t been cultivated for a long time it can take along time for water to drain from it. If the land has been repeatedly cultivated using a rotavator, this can create an impenetrable ‘pan’, which prevents water from draining anywhere. The best way to test to see if your soil has poor drainage is to dig a hole 50cm deep and wide, fill it with water, and wait to see how long it takes for it to drain away. If it takes longer than three hours then you have poor drainage. You can overcome drainage problems, however, by thoroughly digging the area and incorporating rich, organic matter. This helps open up the soil and helps water drain away quicker. You could also try planting your tree or bush on a raised area, and use the soil around the stem to form a mound so any rain can drain away. Many fruit bushes and trees flower in the early spring. This can be as early as April, when there is still the danger of a frost. If frost occurs, the flowers on your bush or tree could die, and you won’t have any fruit for that year. You can avoid this by planting your bush or tree in a sheltered spot where a frost attack will be less severe, and avoid a south-facing aspect, so the flowers will develop slightly later. You could also cover your tree with fleece during the coldest months, or when there is the risk of a late frost. You will need to allow pollinators access to the flowers to fertilise them, however. Pests will always be a problem, whatever you grow, but it shouldn’t put you off growing fruit. Simple planting techniques can ward them off your crop and encouraging natural predators can make a difference to the pest population. Diseases can also attack your fruit bushes and trees, leading to poor harvests and even death of the plant. Again, maintain regular hygiene by removing fallen leaves and fruit, and snipping off infected parts of the plant. Some trees, such as apricots, take a long time to recover after being pruned. 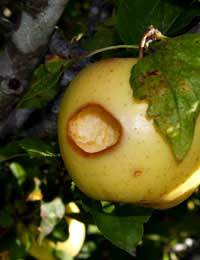 This means the wound left takes a long time to heal, and is therefore more susceptible to being infected by canker silver leaf virus. Always prune your trees on a dry day, and prune delicate trees such as apricots in the summer. Having said that, these problems are quite rare and you shouldn’t let it put you off growing fruit. If you ensure your bush or tree is given the right environment to grow in, and maintain good levels of hygiene, you should have years of fruit harvests with little, or no problems. Hi, our peach tree which is in a generous pot and we have had about a year is seeping fluid (lymph?) from just about all the buds.Don't know what to do. Help much appreciated.Thanks so much. It did have about 2 fruits last year and seemed quite happy until a couple of weeks ago. My lemon orange ; lime trees all bave a problem with small fruit dropping off all ar the zame time. Is it due to the hot weather or something else. Every year, my red currant plants grow well until mid summer, by August the leaves curl up and they all fall off. I have no fruit. In the past, the plants grew very well producing lots of fruit until 3 years ago.I treated the plants with a funguside spray, which did not help. Last year, I severely cut back the bushes leaving only 3 inches of stem above ground. This year the new stems grew well then lost all their leaves again by mid summer. What should I Do? Please see RHS link here which should help you further. Every year, my red currant plants grow well until mid summer, by August the leaves curl up and they all fall off.I have no fruit.In the past, the plants grew very well producing lots of fruit until 3 years ago. I treated the plants with a funguside spray,which did not help. Last year, I severely cut back the bushes leaving only 3 inches of stem above ground.This year the new stems grew well then lost all their leaves again by mid summer.What should I Do? As with all fruit trees, it could be a number of problems. Poorly pollinated fruit can be a possible cause, as inadequate seed formation can affect the development, leading to mis-shapen fruit. Likewise, weather damage, temperature, inadequate nutrients, lack of water, plus disease and insects can also cause problems. If it doesn't seem as though you have insects or disease, it might be that the fruit was affected in the early stages development by something external such as poor pollination or the weather, which will result in ugly looking fruits that taste fine on the palate. we have an apple tree that gives copious amounts of beautiful scarlet fruit from about early August but almost the entire crop falls to the ground before they are edible (white seeds inside).I assumed that black seeds were a sign of ripeness.I've probably binned a hundredweight of good looking apples which have been damaged in their drop. My fruit plants do not have any fruit on them, last year I had lots of blueberries and strawberries, this year nothing. What could I have done wrong? My blackberries have again suffered from what looks like Dry Berry Mite . Is there any cure for this. The little cells first become discoloured ,then dry upwith more and more cells being effected. I pruned my cherry trees in July/Aug as advised by Gardeners World mag to avoid silver leaf disease. Now in Sept my 2 cherry trees (Sunburst) have new shoots and new flowers on them. Is this peculiar as I have never seen new flowers before on my other cherry trees. Will I get a second harvest!!!! It would be interesting to find out if anyone had a similar situation. @praising, this has happened to my pear tree too, the leaves are brown and they have holes in. This hasn't happened before and the tree is well established. Would really like some advice on this one. Some leaves on drarf pear are going dark brown. My plum has holes and some are going brown. Can you tell what I need to do. We have a plum tree that bore fruit for the first time this year but the fruits are dropping before they've matured. We are now left with two plums - not enough for a crumble!! Any ideas on what the problem is, please? I don't know if this is the right place to be asking, but so far I am having no luck. I have been growing redcurrants for 4 years now, I noticed the other day that there is a white almost foamy substance coming out of the main stem of the bush all the way up one side in clumps. It seems to be breaking through the bark on the stem as the bark is broken in places and the white substance is coming out. It seems to be more apparent where a branch meets the stem and the white substance is coming out of the join, where the branch and stem meet. I can only assume this is a fungus or infection of some kind, but can not diagnose it from anywhere. Can anyone help and enlighten me as to what it is and what I can do about it? The leaves on my plum tree have lots of holes in them. What has caused this. The plums seem to be growing ok. I also have a problem withmy pear tree whereas the leaves are curling and although there are a numnber of pears growing they seem to be all bad. My apple tree has had a good crop, but the apples have a black/brown gritty substance in the centres. This appears to work from the core outwards.Somebody suggested a lack of calcium in the soil, so, last autumn I mulched with clam shells.It is not as bad this year as last year, but is there anything else I can do?I don't want to use harmful chemical sprays.Would more pruning help? My raspberrys leafs have all gone like spider webs eaten by some parasite but the fruits seem ok does anybody know what im dealing with and how to get rid?